Middle Eastern countries where Trump has done business weren't included in his refugee and visa ban. Here are the countries covered by Donald Trump's refugee and visa ban: Syria, Iraq, Iran, Libya, Somalia, Sudan and Yemen. And here are countries where Trump has business interests: Egypt, Qatar, Turkey, United Arab Emirates and Saudi Arabia. In Saudi Arabia, Trump opened several businesses during the campaign and then closed some of them in December. The banned countries were first named in legislation from the House of Representatives. 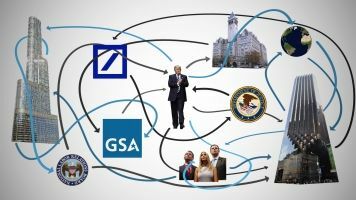 But because Trump won't separate himself from his business, there are still questions over his conflicts of interest.